When the weather turns chilly, a hot soup or stew is a must. Living in Los Angeles there’s plenty of options to fill that need, but some nights call for something a little more adventurous than a pork-heavy ramen or hearty bowl of pozole. Look no further than Koreatown, where there’s a few restaurants specializing in everything goat, the highlight of which is a spicy stew. The stew, interestingly enough, is nearly identical in preparation to Korea’s infamous dog meat soup, but this being America and all, goat has been substituted for it’s apparently similar taste and texture. Nonetheless, Koreans are quick to point out the health benefits of eating goat, perhaps none more than it’s “sexual boosters,” if you will. Seriously though, the USDA does say that goat meat has less cholesterol and fat than beef, chicken, and pork, with the same amount of protein, and they’re really easy on the environment in terms of raising them as livestock. 70% of the world can’t be wrong, as it is the most widely consumed meat on the planet. 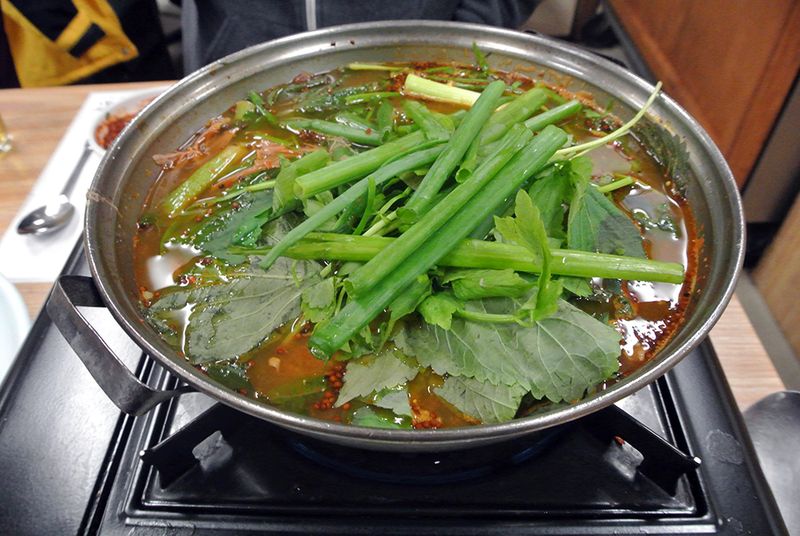 At Mirak, a homely little restaurant tucked into the corner of a nameless Koreatown plaza, every table will have an electric burner on it with a pot of bubbling, orange-red soup strewn with greens and chunks of meat. Most of the predominantly male customers will be red in the face from the bottles of Soju that line their tables, frequently stepping outside to smoke a cigarette. A pair of middle-aged Korean women traverse the tiny restaurant re-filling banchan and checking soup levels. When enough of the hot broth and tasty meat have been eaten, a waitress will come by and add rice and seaweed to make a fried rice, plenty helpful in absorbing all of that Soju. There’s three other goat dishes available (as well as some non-goat items, but really you’re in the wrong restaurant if that’s what your after) that are certainly worth ordering because one serving of the soup can easily feed two people, leaving room for an additional item to share. 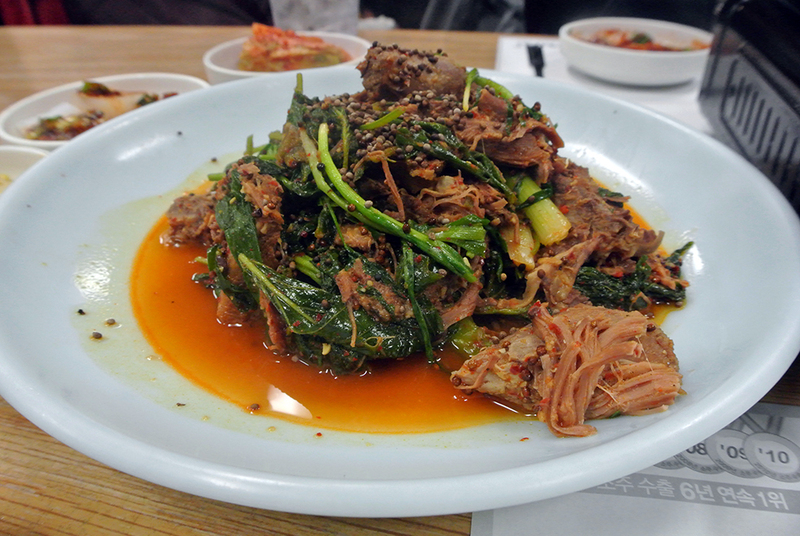 No Korean meal is complete without banchan, and Mirak proved no different. The spread here was pretty simple: kimchi , k0ngnamul (cold bean sprouts dressed in sesame oil), cheongpomuk muchim (cold mung bean jelly topped with soy sauce and scallions), miyeok (seaweed) slathered with spicy red gochujang, and gamja jorim (Korean glazed potatoes). I happily snacked on all of them throughout the evening, finding the soft potatoes to be the most enjoyable of the bunch. 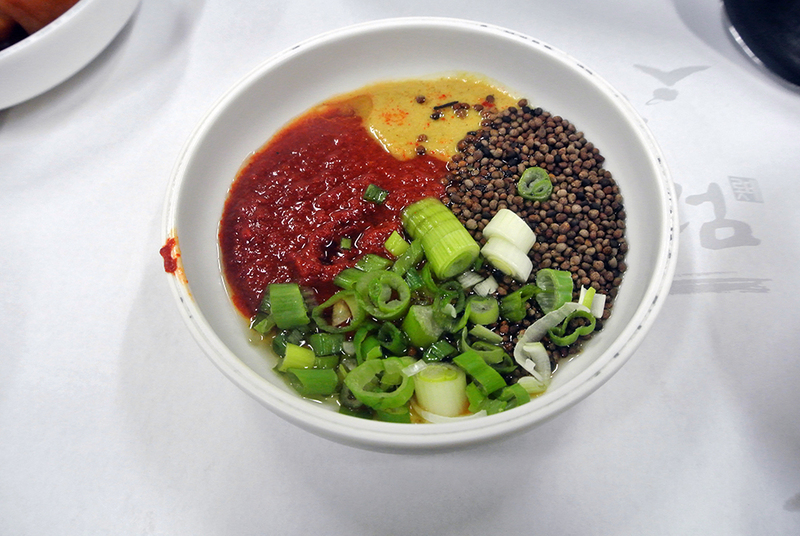 Our waitress dropped off a tiny dish filled with an array of vibrant colors and textures: mustard, perilla seeds, scallions, and chile sauce. She instructed us to mix everything together and use it as a dipping sauce. 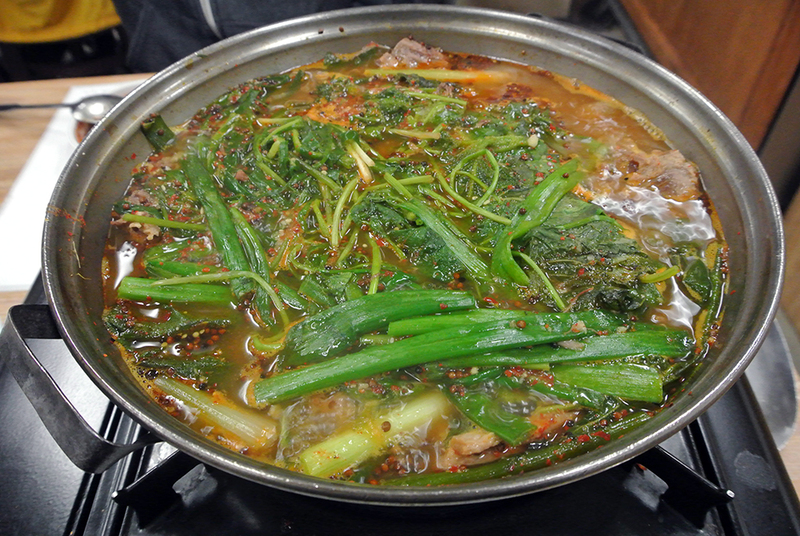 Seasoned Black Goat sounded simple enough on the menu (although translations can prove misleading sometimes), but it was just that – pieces of tender goat in a light broth with some sauteed perilla leaves and seeds. The meat wasn’t at all gamey, as one might expect, but instead was relatively mild and a bit earthy in this particular preparation, somewhere between beef and lamb (or dog) as far as taste and texture. Swiping it through the dipping sauce, spicy and vinegary from the mustard, was indeed the right move, while the random pop of perilla seeds went off like tiny Nerd candy in the back of my mouth. After we had eaten about 3/4 of the way through the seasoned goat, the real reason for this whole visit finally arrived in all its glory. 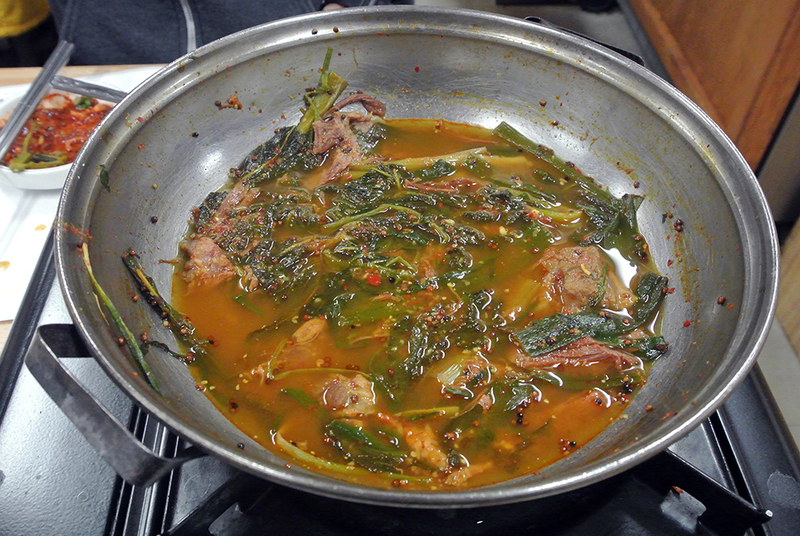 On top of the amber-hued broth was a heap of perilla and other greens, obscuring the meaty chunks of goat simmering beneath. The fragrant aroma of spices immediately met my nose and I had to restrain myself from diving in face first. After a few stirs and allowing the soup to come to a boil, the leaves and stalks began to wilt and the stew was ready to eat. We ladled the pots contents into plastic bowls, sipping the broth and remembering to utilize the rest of the spicy dipping sauce for the goat. I found the taste of the meat to be more concentrated here compared to the first dish, earthier and full of spice absorbed from the broth, but still delectably soft and able to be pulled apart with the slightest tug. At this point our waitress looked over and motioned to the remaining soup. I took this to mean that we had eaten enough, and told her we were ready for the bokkeumbap to finish the meal. 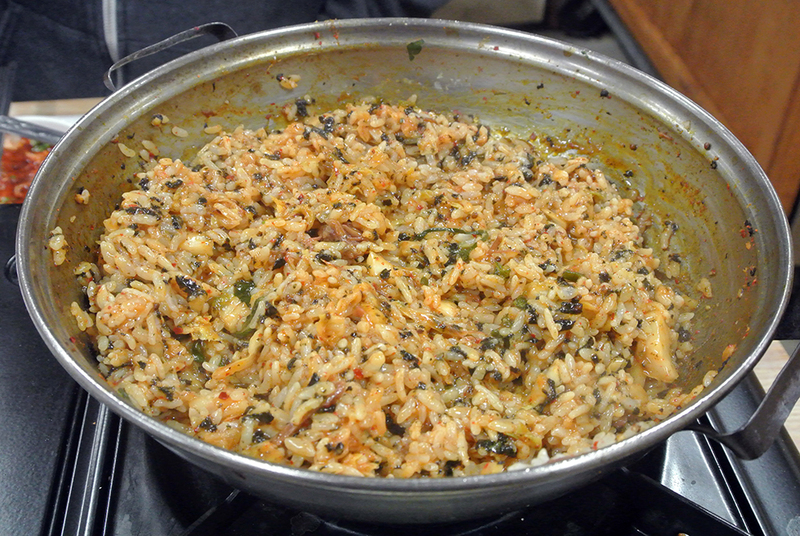 After dumping in two servings of rice, chopped kimchi, and seaweed, everything was mixed together over high heat and then left until a nice crust formed along the bottom. Perhaps we had left too much broth, because it never reached the crispy fried rice it was supposed to despite our patience. Still, the flavors were there and it was a good way to end what was a very filling meal. For the most part, ethnic restaurants like Mirak and the Mexican places that serve up bowls of birria are the surest bet to curb your goat cravings. It’s only a matter of time before more Western restaurants start cooking goat on the regular, though I know some like Salt’s Cure already do. I’m not ready to proclaim goat the meat of the future and make it a staple of my diet, but I’m all in favor of adapting my eating habits for the better of the environment and my health. Plus for most people, this stew is likely the closest thing to ever trying that dreaded dog meat. However, if the real thing tastes anywhere as good as this American-friendly version than I’d have a serious moral dilemma on my hands.